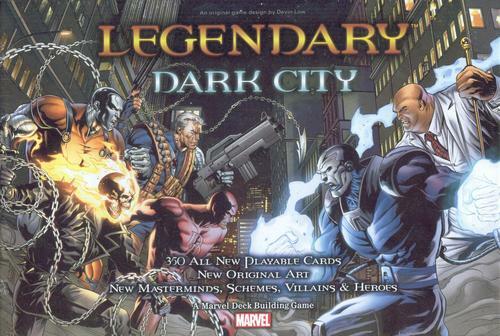 The Dark City Expansion for in Upper Deck’s Legendary games is perhaps an unexpected one for the franchise. The base game introduced a number of different characters and scenarios, but it did not really go too far in either direction in terms of the scope of the game. Comic book characters are roughly divided into two different camps, the street level and the planet busters. Most of the “street level” masterminds and schemes from the first game proves easy enough to beat, while the few more powerful schemes proved to be more challenging. This led to more experienced gamers mostly focusing only on the bigger and badder schemes as opposed to the smaller scale ones. Despite this set of mechanics, for the first expansion the series seemingly decided to go smaller and to focus on the street as opposed to the skies. It is likely due in part to fan service that the theme behind this expansion was released second, only after the base game. After all the street level contains a lot of the more popular characters that fans would want to play, even if the track record is that it makes for a worse game play experience. Although there are some more obscure characters such as Cable, Domino and Forge, there are also fan favorites including Angel, Bishop, Blade, Elektra, Ghost Rider, Iron Fist, Iceman, Jean Grey, Professor X, The Punisher, Daredevil and already the second implementation of Wolverine. The expansion is designed to be more street level, but it also does better to address the fact that the street level encounters in the base game were a bit too easy. Instead here there are more complicated scenarios, some of which incorporate in some famous story arcs from the comics. It is also worth mentioning that the bystanders are expanded upon here. While it might be nice to see some added variety in the starting decks or in the S.H.I.E.L.D. deck (of which there are 2 and 1 different kinds of cards respectively), at least the otherwise bland bystander deck is expanded upon with news reporter, paramedic and radiation scientist. While it is somewhat unlikely to run into too many radiation scientists on the street, this at least adds a new dynamic to these cards which no one much seems to care about, as the specific type of bystander can now have different effects. For instance rescuing the news reporter allows the player to immediately draw another card, which could have a big effect (or no effect) on the passage of a particular hand and could theoretically turn one’s luck around. In the end this is not kind as good as the original, but more due to a lack of strong central theme. As opposed to other expansions which help to refine a player’s interests in the game, this one could have just as easily served as another half to the base game. There is little to distinguish this expansion aside from the individual characters included. Certainly some gamers that are also fans of comics are going to want to pick up this expansion solely for the ability to play as their favorite characters, but equally this expansion does little to refine the game, only to make it bigger. It is still a fun expansion, only that perhaps more could have been done.